Guess what? I had my first post-injured 5K of the year! I wasn't planning on racing but I came across the sign for it and decided to run it. I ran in this particular 5K two years ago so I was familiar with the course. It's pretty flat until a slight incline right before the end of the third mile. Pretty easy. After determining the night before that I would do whatever it took to get under 30 minutes, even if I threw up (which I never have, just so you know -- mostly, I just feel like crap after a really hard run and can't eat anything for a few hours), my thoughts were on the pre-race dinner. My mom took care of that. 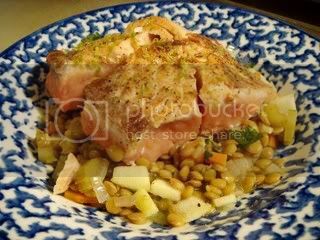 My mom made pan-seared salmon with lentil salad. The salmon was perfectly cooked and had a great meaty taste, somewhat flaky innards, and a perfectly pink center. The lentil salad was great, the perfectly cooked lentils (firm but not mushy -- al dente?) paired brilliantly with the crisp, tart Granny Smith apples, cilantro, and sauteed carrots and onions. Chopped cilantro was added at the end and gave each bite that featured it a great flavor. I grated some lime on top of the salmon for presentation and to add another flavor burst. So the 5K? Breakfast was pretty plain and easy to digest, whole wheat toast (sans butter) with honey, the red Monster Energy, a bit of oatmeal (just plain oatmeal), and sips of coffee. At the site of the race, I warmed up for 10 minutes and then waited around because they started the race LATE. Gosh. That's killer, you know, because the benefits of warming up only last for so long. I resisted the urge to start off as quickly as everyone else did (I literally seemed as if everyone went really fast at the beginning) and maintained my own pace. I passed whoever I came up to, but I didn't really speed up. Surprisingly, I hit the first mile at 8.34 and was really stoked because it felt extremely easy, no wheezing or cramps. Remember, I have been running 10's and 11's. The second mile I wanted to maintain roughly the same pace, but speed up a bit. I passed more people and some passed me, which made me wonder if I was slowing down or if they sped up -- impossible to tell, so I just maintained my pace. I clocked in at 8.30. I was really happy because I stayed consistent with the pace. The third mile was the time to speed up, which I did. I slowly started surging and passing more people, made sure my form was correct (shoulders level, running on my forefoot and not my heels, left hand-right foot, right hand-left foot, keeping my head down, not swinging my arms too high or too low and keeping them from crossing my body), and made sure I was breathing correctly. I kept with this one girl, who ended up getting a bit ahead of me when the hill started. At the last 100, I wasn't sure exactly where the finish line was, so when I sprinted really well I passed the girl but I ended up passing her after the finish line, which I wouldn't have done had the finish line been properly marked (this was a poorly set-up race and it obviously didn't improve much since 2005...). But I was happy with my finish. I saved my overall time and recalled it, first two miles, and to my surprise the last mile was 7.33!! w00t! My overall time was 25.37, which was absolutely tricked out because I didn't even know I was capable of a time like that at this point. 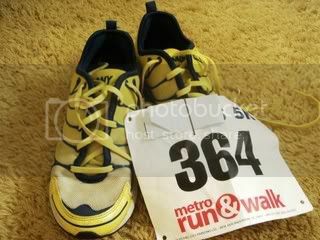 The weather was perfect, a bit chilly but it warmed up to a great temperature after running and it wasn't unbearable. In fact, there were showers of rain earlier, but it cleared up in time for the race. I couldn't have asked for better conditions. After the race, there was this photographer who kindly answered a few camera questions (he uses a Canon, though I sadly cannot recall which sort -- that's what I get for not writing it down. I think it was from the EOS series with a 20 mm lens), which was very kind of him to do so. I stayed for the awards ceremony (not to race producers: the kid's fun run should take place just prior to the actual race start, not after 15 minutes after the finish when everyone is waiting for the awards), then went to Panera for an asiago bagel, which they finally had. You see, every time I go to Panera, they are out of those particular bagels. I ordered it toasted with a small coffee, and I found out that a single shot of espresso is only .41¢ and tastes much better than Starbucks! And I freaked them out, unintentionally, by ordering just the espresso. The perfect end to a chilly day was my dinner. 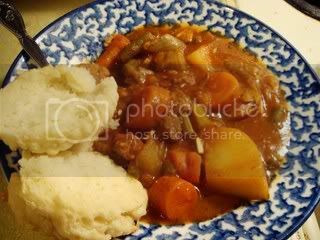 Beef stew with biscuits! A great, complex tomato broth, slightly thick, with chunks of tender vegetables and beef cubes. The biscuits were hot from the oven with crisp outtards and fluffy innards. Congratulations on the 5K! I'm sure the salmon dish helped you get started! jenn and oliver - Thanks! I think you're right, the protein to me works better than carbs. I remember Bernard Lagat (he won both the 1500m and 5000m at Osaka this year) say something about eating steak before his race. I think carbs just go through me faster than normal or something. Lovely blog you have, by the way! I am envious of runners - I always wish that I could be one, but my poor back just can't take it. But maybe I can eat the pre-race dinner still??! Omg, that's so totally cool! I ran an 8k this past sunday and I was also surprised by my time. Not as good as yours (45 mins) but it's faster than what I normally do. Great job! Congrats on the 5k! I would love to have that kind of time. I try to do a 5k a month, but I'm not as fast as you. Deborah - Help yourself to the dinner -- I mean, when I post the recipe, that is! Actually, with a proper start-up running plan, anyone can run. If you'd like, I can recommend some books that offer excellent advice. Marias23 - Cool, nice to meet another runner! It's still a great time, your pace was a little over 9-minute miles. Congrats! Yeah, I kind of put most of my extra time into running. Lately, because I've been coming back from an injury, most of my runs have been insanely slow with a few fartlek runs thrown in for sanity. The slow running really has helped because I'm not tiring myself all the time and it enables me to run faster when it really matters. Good job to you for making the time to run, though. It's a great thing to give yourself! Way to go!!!!! So excited for you. I know you're thrilled to get back to running! I wish I had to guts to do stuff like that, but I hate competing with others. Kudos! Congrats on the 5K - that is so awesome! I am happy you had some great food to keep you going! Valerie - Thanks! For the competing part, I break it into three parts: Firstly, I compete against myself mentally. Secondly, I compete against my own time. Thirdly, I compete against others. So I tend to pick and chose how to "compete" in certain races and that keeps the focus off of competing against others unless I really want to. Julie - And made even better because it tasted great! Great time on the 5k! 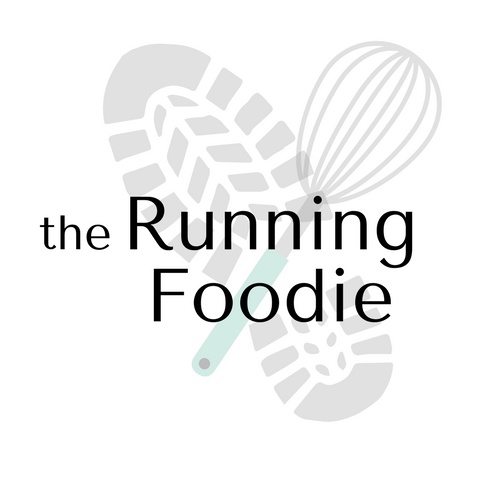 I'm a runner/cook as well -- just ran the NYC marathon last weekend!